Seneca Casinos will deliver an unprecedented level of excitement this summer to the Western New York, Southern Ontario, and Northern Pennsylvania and Ohio regions with “Summer Rush” – a package of world-class entertainment, promotions and special events during June through August. 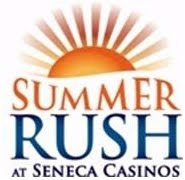 Summer Rush takes place at the Seneca Niagara Casino & Hotel in Niagara Falls, Seneca Allegany Casino & Hotel in Salamanca, Seneca Buffalo Creek Casino in Buffalo and the new Seneca Hickory Stick Golf Course in Lewiston. Just some of the many offerings include blockbuster concerts by Daughtry, Steve Miller Band, Melissa Etheridge, Martina McBride and more; expanded hours at the casino restaurants; and eye-opening promotions such as a cruise-a-day giveaway in August. Summer Rush features more than two dozen performances at the Events Center and Bear’s Den Showroom at the Seneca Niagara Casino & Hotel in Niagara Falls as well as the Events Center at the Seneca Allegany Casino & Hotel in Salamanca. Summer Rush debuts with Aretha Franklin’s return to the stage on Memorial Day weekend at the Seneca Niagara Events Center. Additional star-studded performers at the venue include Daughtry, Steve Miller Band, Paul Rodgers, Martina McBride and Jeff Foxworthy (two shows). The excitement also takes place at the Seneca Allegany Events Center this summer with The Guess Who, Kenny Rogers, Tom Arnold, Melissa Etheridge, Big & Rich with Gretchen Wilson, and Ronnie Dunn. Each Events Center location seats up to 2,400 people with no seat further than 100 feet of the stage. Entertainers at the Bear’s Den Showroom include Patti Austin, Tonic, Oh What a Night – A Tribute to Frankie Valli (two shows), Ninety Miles, Dave Mason, Big Bad Voodoo Daddy, John McDermott, Daryl Stuermer Band, Leon Russell, The Association and Johnny Winter. The intimate venue seats up to 440 people with no seat further than 40 feet of the stage. Tickets for shows at Niagara go on sale at 10 AM on April 28 (June shows), May 5 (July shows) and May 12 (August shows), while tickets for shows at Allegany go on sale at 10 AM on April 29 (June shows), May 6 (July shows) and May 13 (August shows). Starting prices for seats range from $20 to $65. Tickets will be available at all Seneca Casino box offices, Ticketmaster.com, all Ticketmaster locations, or by phone at 800-745-3000. Promotions during June include a boat and trailer giveaway at Seneca Allegany Casino, a $50,000 summer slot tournament with a $10,000 grand prize at Seneca Niagara Casino, and the Seneca Summer Shopping Spree at both casinos – offering guests the opportunity to purchase some of the summer’s hottest items and new technology using gaming points. To kick off July, Seneca Allegany will host its extravagant fireworks display on Friday, July 1. The following evening, an equally-spectacular fireworks display will take place at Seneca Niagara. In addition, Seneca Niagara Casino will host a backyard makeover promotion with $30,000 in prizes throughout the month, such as patio sets, grills and Home Depot gift cards. On July 30, the Seneca Allegany Casino will offer a giveaway for two Sea-Doo watercrafts and a trailer. And throughout the month at all Seneca Casino properties, baseball fans will have opportunities to win fun promotional items and tickets to see games in Buffalo, New York and Boston. The month of August features an unprecedented promotion throughout all three casinos: cruise giveaways. There will be a winner each day at Seneca Allegany and Seneca Niagara; a winner will be drawn each Sunday at Seneca Buffalo Creek Casino. To match the expected high demand of food during Summer Rush, the Seneca Niagara Casino & Hotel will operate its new Tim Hortons and Cold Stone Creamery co-branded dining outlet 24 hours a day, and its popular Asian restaurant Koi will be open for dinner seven days a week instead of five. Golf fans who want to stay overnight at Seneca Niagara Casino & Hotel and play at Seneca Hickory Stick Golf Course can enjoy a new package with discounted hotel rates. The course is enjoying its first full season of golf and was recently ranked No. 6 Best New Public Course in the U.S. by Golf magazine. Golfers will enjoy a just-opened clubhouse and restaurant. Fans of Summer Rush should be on the lookout for an upcoming coupon book with $200 of savings toward retail, dining, golf and spa services. In addition, Seneca Casinos will be rolling out a partnership with nearby hotels throughout the regions that will provide hotel guests with casino vouchers, as well as a new savings card for use at Seneca Casino retail shops and at the Fashion Outlets in Niagara Falls. And finally, amidst the adrenaline of Summer Rush, the 26-story hotel tower at Seneca Niagara Casino will quietly undergo its first renovation since opening on December 31, 2006. Each of the nearly 594 AAA Four Diamond Award-winning deluxe guest rooms and corner suites will receive a full cosmetic makeover with rich, warm and colorful contemporary accents for improved presentation, as well as new furniture and amenities. Construction will take place two floors at a time beginning in July and is slated for completion at the end of the year. Tickets are available at all Seneca Casino box offices, Ticketmaster.com, all Ticketmaster locations, or by phone at 800-745-3000.